Maine Yoga Retreats for up to 11 participants are a result of the years of personal and facilitated retreats we have taken and led since 1980. We have found that the format of yoga poses, sitting meditation, self-inquiry, pranayama, transformational breathwork, silence and unstructured time in the natural world creates an environment conductive to dropping the details of daily life, releasing patterns of the past and opening to the embodied state of Divine Love, our True Nature. All the practices enhance physical, mental and spiritual well-being. Emphasis is placed on healing and evolution of consciousness. These retreats are focused on personal transformation. Anyone interested in a spa-type experience is advised to look elsewhere. Yoga sessions include classical hatha and vinyasana, yin yoga and restorative poses. We encourage fluid movement and personal exploration in the yoga classes to cultivate an internal reference point. Pranayama brings awareness to the breath and increases the availability of Prana, the life-force. Breathwork is a dynamic practice for releasing, purifying, healing, and attuning with Source. Bridging the conscious and subconscious, conscious breathing is one of the quickest ways to personal transformation, enhanced well-being, and the direct heart opening experience of Divine Love. It is a profound part of the retreat process. Self-Inquiry is an opportunity to awaken to the truth of who we are. The embodied recognition and experience of long-held patterns of conditioned behavior lifts the veil that keeps us from peace of our true nature. Meditation periods are approximately 20-30 minutes and draw on the Vipassana and non-dual traditions. Guidance will be offered in breath awareness and in open attention with the focus to relax and simply be with what is, as it is, without manipulation, so that we may come to rest in the natural state of awareness. Unstructured Time allows for walking the woodland paths, napping, taking a wood-fired sauna, a swim in the spring-fed, crystal clear secluded pond, or for doing nothing. A container of shared silence is maintained during the yoga retreat, except during the sessions. Silence is restful, being the mirror of our natural state. This silent community creates a supportive environment in which to surrender to the inner silence, allowing us to question our conditioned beliefs and surrender to the truth of our being. The morning after arrival participants are asked to refrain from social conversation with one another during meals and free-time. We call this “social silence.” This social silence ends after the morning session of the last day. To read more about silent retreat you may go here. A gallery page of photos is here. Wholesome Meals are prepared fresh three times daily.Much of the food comes from the extensive organic vegetable gardens on the property. Patricia and Surya have a passionate interest in understanding the relationship between a wholesome diet and vitality and the meals served on retreat reflect this commitment. The menu is vegetarian and includes dairy, and eggs. Special dietary needs for gluten-free and lactose free meals can be accommodated with advance notice. Participants at Maine Yoga Retreats are asked to come prepared to be fully present during the retreat, attending to personal and business details before coming on retreat and taking a break from computers and cell phones. This will greatly enhance the retreat experience. Private Interviews are available during the retreat. “Frequently asked questions” may be found by going here. Arrival between 4 and 6 pm the first day of the retreat. 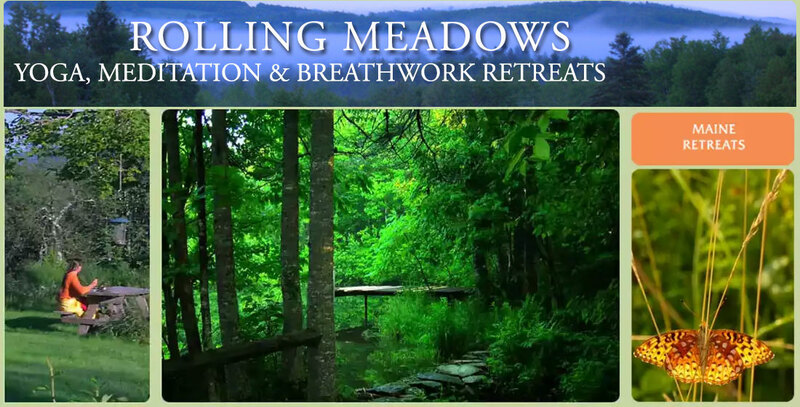 To see yoga retreat dates at Rolling Meadows click here. Please note that retreats are offered only on the dates listed on the Calendar Page on this site.